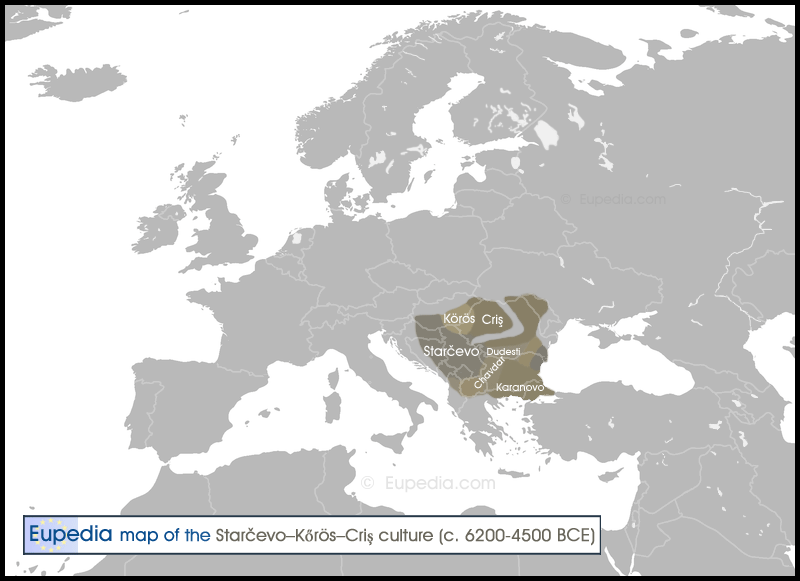 Encompasses various Early Neolithic archeological cultures from the Balkans, including those of Anzabegovo, Chavdar, Conevo, Criș, Dudești-Cernica, Karanovo, Kőrös, Kremikovci, Ovtcharovo, Porodin, Starčevo, and Tsonevo. It is commonly known simply under the appellation of Starčevo culture. Represents the advance of Early Neolithic farmers from Anatolia to south-east Europe, including present-day Bulgaria, Macedonia, Kosovo, Montenegro, Serbia, Bosnia, northern Croatia, south-west Hungary, and Romania. The Starčevo–Kőrös–Criș culture is the precursor of the Alföld Linear Pottery, the LBK culture, and the Cucuteni-Trypillian culture - in other words all the Early Neolithic cultures from northern France to western Ukraine. Their Neolithic agricultural economy was based primarily on the cultivation of crops from the Fertile Crescent, such as Emmer wheat, Einkorn wheat, barley, spelt millet, pulses (peas and bitter vetch), and buckwheat. Some fruit trees were also cultivated, including plums and apricots. Starčevo farmers bred livestock, especially goats and sheep, but to a lower extent also cattle and pigs. They also supplemented their diets by fishing in rivers and hunting deer and wild boar in forests. Starčevo farmers lived in dug out rectangular dwellings with a timber frame, wattle-and-daub walls and clay-plastered foors. Most houses were small, measuring approximately 7–10 m in length and 4–6 m in width (i.e. 30 to 60 m²). They were built on a single storey, which consisted of a single room, without any internal divisions. Some structures may have contained a loft on the second floor, probably used as a granary. Pottery types varied between regional groups, and could be painted in white-on-red and dark-on-red as in the Starčevo culture around Serbia, or be unpainted as in the Körös culture in Hungary. Ceramic vessels were typically decorated with net patterns, spirals, garlands, floral motives, ridges, and finger imprints. Anthropomorphic and zoomorphic representations of goats and deer were common. Like in other Neolithic cultures, most tools were made of stone, bones or antlers. Flints, obsidians and quarzes were used to make blades, cutters, scrapers and drills. Axes, hatchets and grinding stone were made of sandstone, limestone, granite, quartz, and other rocks. Very few graves were found in the Starčevo culture, and those were generally single graves. Most burials identified belonged to women or children, who were placed in the graves in a crouched position, lying on the right or the left side. They were inhumed under the floors of personal residences, a practice that continued until 4000 BCE. Graves rarely contained goods. When they did, it was pottery, grinding stones, flint tools or jewelry. 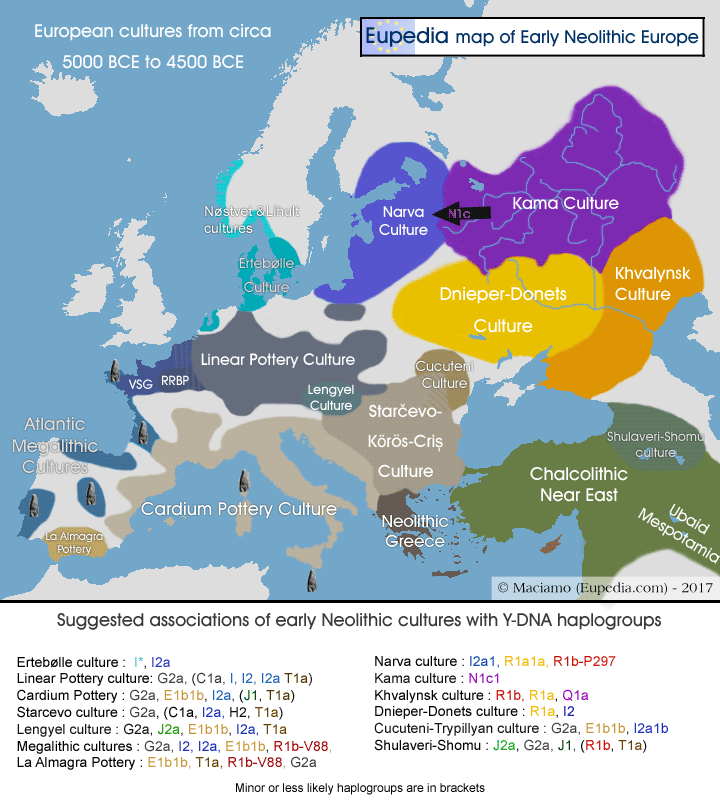 The sequencing of ancient DNA samples of Early Neolithic cultures conducted since the early 2010's confirmed that the Neolithic lifestyle was brought to Europe by Anatolian farmers - represented by Y-haplogroup G2a. For the first 1,700 years of agriculture in the Balkans, those Near Eastern farmers did not intermingle much with Mesolithic European hunter-gatherers in the Balkans. The few Mesolithic Balkanic lineages that may have been assimilated by farmers would have belonged to Y-haplogroup I2 and mt-haplogroups HV0 and V, and possibly J1c, J2a1, K1c and T2. Since the Balkans were relatively depopulated in the Mesolithic, it is likely that these assimilations took place in north-west Anatolia, where European hunter-gatherers had migrated. Ancient DNA tests have shown that Starčevo people had fair skin, brown eyes and dark hair, in contrast to Mesolithic Europeans who had darker skin, dark hair, but blue eyes. Both groups were lactose intolerant. The following mtDNA samples were tested by Lazaridis et al. (2013), Gamba et al. (2014), Szécsényi-Nagy (2014), Haak et al. (2015), and Mathieson et al. (2015).